ROCCAT™ will unveil exciting new features for its exclusive ROCCAT™ TALK technology at gamescom in Cologne, Germany, August 17-21 and I would like to invite you to be part of it. Be sure to take this opportunity to meet us in about two weeks time! 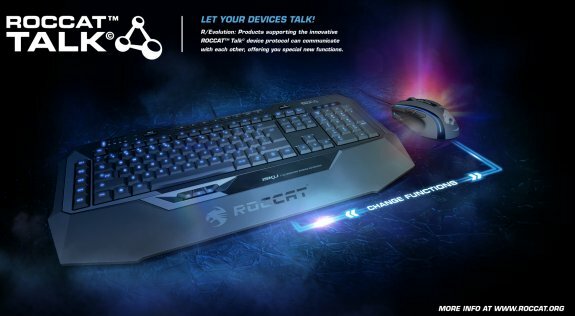 The groundbreaking ROCCAT™ TALK protocol lets gaming devices work together for the first time ever, so players can take advantage of that harmony to gain unprecedented Set Bonus advantages that let them play better, win more and enjoy a more intense game. The new ROCCAT™ Isku Illuminated Gaming Keyboard and the ROCCAT™ Kone[+] Max Customization Gaming Mouse are the world’s first devices to be outfitted with the new tech and both will be featured in exciting hands-on demos – so you can see firsthand how exclusive ROCCAT™ Easy Shift[+] and EasyAim technologies work wonderfully when used with a synchronized Isku and Kone[+]. What’s more, ROCCAT™ will unveil ROCCAT™ TALK FX — a bold new tech that translates on-screen action into exciting sensory effects on the keyboard and mouse. Gamers will be able to see the advanced new tech in action during demos of Runes of Magic – Runewalker Entertainment’s mega-hit MMORPG. ROCCAT™ will be at the Runes of Magic area, Hall 9.1, Stand B-011/C-010. Team members will be on hand to answer any questions.